Let’s Hit the Beach… Surf’s Up! A new collection of Virtual Sets where you can make anyone into an expert surfer, in the click of a mouse. 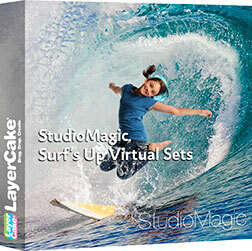 The StudioMagic Surf’s Up collection includes 35 high-resolution surf images,with boards minus the riders. With our StudioMagic Pro-Panel, you can easily cutout your subjects and drop them into the action. Each virtual set includes layered special effects splashes that are placed in front of the subject for realism. Surf’s up is great for young adults, senior portraits, kids, Facebook images or anyone who wants to have fun with PhotoShop. The StudioMagic Pro-Panel is compatible with PCs and Macintosh OS and works with PhotoShop CS5-CC 2015. Lean How to use Surf’s Up.